Multi-purpose journals for any occasion, with inspirational verses interspersed on the pages. Hardcover with pearlescent accents, elastic closure band, 144 pages. 14 x 19 x 2.3cm. Customer Reviews For "Impulse Journal: Footprints"
I bought this as a gift. It is a lovely format, with restful colours on the front as shown in the picture. Inside the journal has verses interspersed throughout, with lined pages for journal writing. 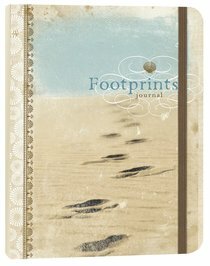 It has a sand watermark throughout, keeping the footprints theme over all the pages. An elastic is attached to help secure the pages closed when journaling is done. All in all a lovely product for writing thoughts and prayers down in.